I am so sorry that I have been away from the blog this month. There was a wolf at my door and you know how much I like wolves, I got distracted. 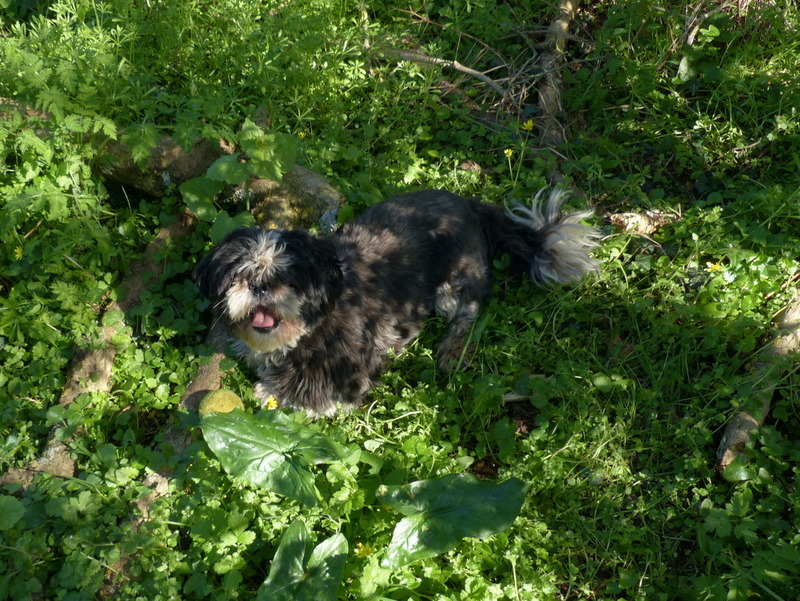 Anyway Wolfie has gone and we would like to get back to nature. I will try to post every day for a while, to make up for my recent absence. So much has been happening and there is a lot to blog about. I am glad to find that I have not lost my touch with the Faeries. Tomorrow we could go up and look at the Bluebell woods. 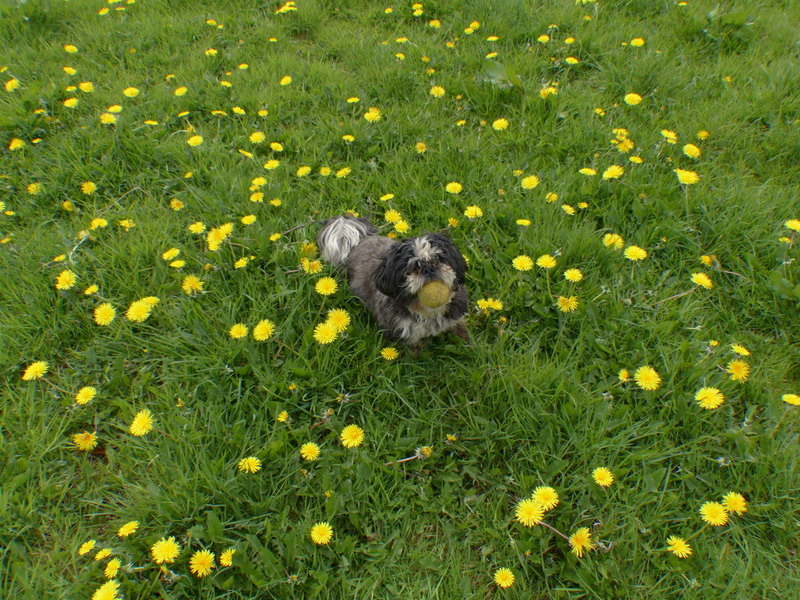 Or we could video Fizz searching for her yellow ball amongst the Dandelions. The world has turned beautiful. 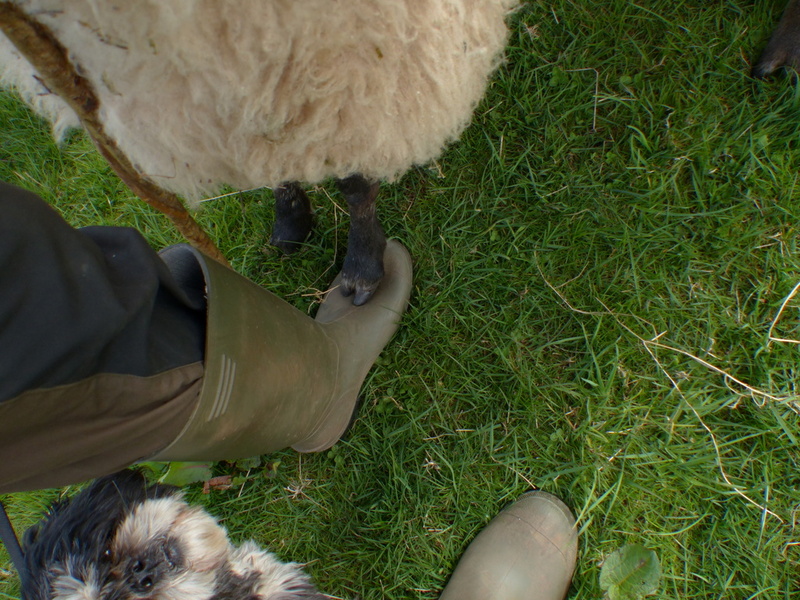 Let me put this little animal down…. Whoa! Hold on! I’ll get a ladder. That plant that I am putting him on is Garlic Mustard. 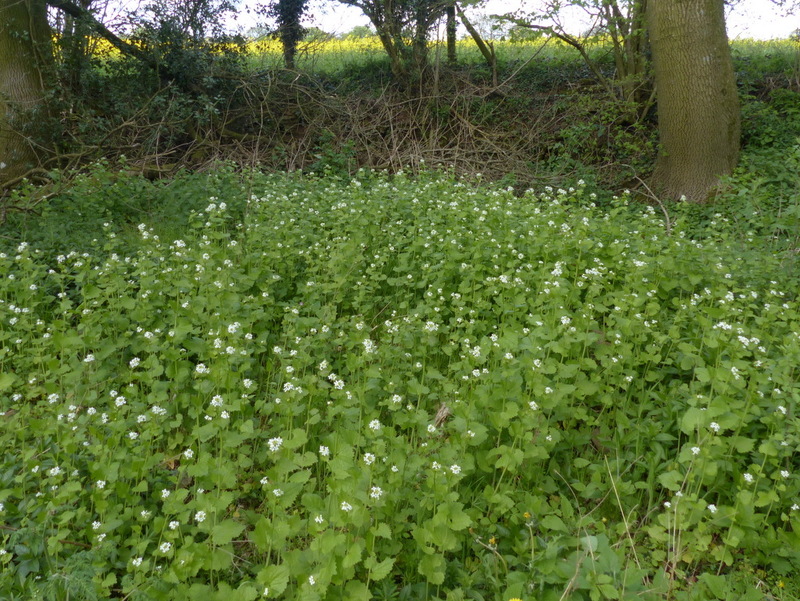 Next to Wild Garlic it is one of the tastiest herbs around at the moment. This is one of the very best reasons to get into foraging. Picked fresh it is better than anything that you could buy in the supermarket. Foraging is not just about nettles and Dandelions, some of it is Caviar (without the fishy taste) and you just can’t buy it in the shops. It is growing in abundance in my neck of the woods and deserves a post of it’s own. Oh lookit! A brown Faerie. 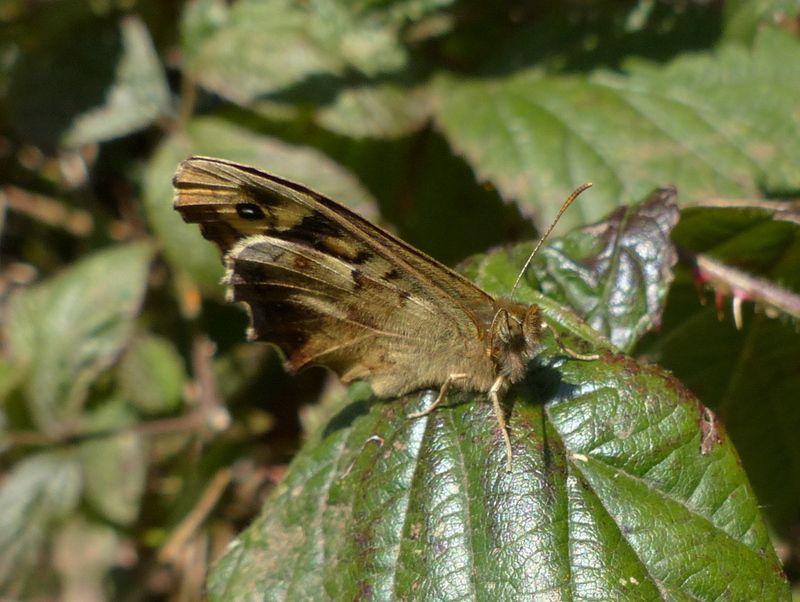 That would be a Speckled Wood. It is so nice to have them back. I am going to cut this post short because I want to post it tonight. Sometimes Fizz and I get ourselves into some pretty dangerous situations. I tend to shut other people out in case they get hurt by the terrible dangers that we have to face. So I haven’t been reading my email or attending to anything just recently and I am sorry if I seemed to be ignoring you. I will be back on top of everything tomorrow. I had a stroke of luck and came out on top. I don’t have to leave the farm or Fizz, or do anything that I don’t want to do. So it goes. I am so glad you are back. I’ve missed your posts! I absolutely love your videos of Fizz and all the beautiful pictures you share. Good to see you back. I was so happy to see this post in my email. Lovely walk and photos. I’m hoping that ‘Bendy Peg Leg’ was your stroke of luck! Super to have you back Colin, and Fizz of course. I’ll get cracking on that limerick…! Great to have you back – looking forward to your post a day! Thank you so much 🙂 It is a windy and wet one today, maybe a good day to visit the Bluebells. I am so glad you are alright. I have been very worried and have thought of you every day. Your photos are lovely this evening – you have made me very happy. Thank you Clare 🙂 I was a bit worried too but it turned out okay and that will do for me. I don’t have a religious background. About fifteen years ago my then wife got cancer and I started to pray. Uneducated, my prayers were either deals (Please do it to me, don’t do it to her) or threats (Take your hands off my wife) God didn’t strike me down and my wife survived. This went on for about three years and I had quit a management job and taken a night shift, I prayed constantly all night. When it was over I had to wonder what I had been doing. I am a clever man and I don’t believe in God. It doesn’t matter what you believe, there are circumstances when anybody will pray, not for your own life but for somebody else. I had to invent my own God and I decided that he was everything that was good in Humanity, without any of the negatives (No burning other religions in eternal hell fire or any of that nonsense, children born into another faith receive no punishment from the giant invisible bear) I am not mocking religion, there is something that walks beside me. He is not afraid of me and I am not afraid of him, we love each other. He created everything that I photograph. That is why my photographs are free to download. I don’t feel that this is my work. When you get old you lose your marbles. I am happy to have misplaced my marbles. I have a deep love of the Bear beside me, just exactly as he loves me. I don’t understand it but it is not important to understand it. Something very beautiful is going on but I am not the artist. Colin, your God concept is absolutely beautiful. I always thought God was part of me, but after my heart surgery, I believe I’m part of God. Let’s take organized religion out of it. Excellent news, Colin, to the relief of us all. Safe is good. Wolves are good but not when they are hungry. Have a glass of Fizz to celebrate. Thank you Andrew 🙂 I hope all is well with you. I will catch up as quickly as I can. I’m so glad you worked out all your details, to know what your life is for the next year. You get security and we get to have you share things with us. You don’t have to leave the farm! So we get more posts. Wondrous news. Thank you Emily 🙂 I am looking forward to catching up with your Bees. Well you had a lot of us wondering what was up. I am so very, very pleased that things are looking good for you. And I wish we had wild garlic and Garlic Mustard. You can’t imagine just how good it is to hear from you. missed you…oh and that silly little dog too. You’ve been missed. I already started worrying and scrolling up and down the reader looking for Fizz. I’m glad she wasn’t food for the wolf 😀 welcome back! Thank you Becky 🙂 Fizz has been a good friend for the last eighteen months. She is so selfish, she doesn’t care what else is going on she just wants to play and it is good to be made to play every day. Plus, a Wolf in Sheep’s clothing could not get past her. Welcome back, I was missing your post. Thank you 🙂 There will be many more posts to come now. I have been given the time. Nice to see you and Fizz again. What a story with the wolf. You and Fizz deserve a happily ever after. Peaceful walks in nature and moments of pure joy. Wonderful to see you, Fizz and the faeries. You make my day! So good to see you and Fizz again! I thought we lost you guys. I’m glad things are working out for you and you don’t have to leave Fizz or the farm. Been praying for you! Thank you Sandi 🙂 We are looking forward to catching up. Love the butterflies and the bluebells. Went plant shopping today and brought plants nothing like you saw. Thank you Bettylouise 🙂 I am hoping to find new plants this year. Things that I have never seen before are always the best. Colin, I commented above in reply to your reply to someone’s comment. Just want to tell you that you have been missed and a whole bunch of us are so glad you’re back. Take care! Thank you Maureen 🙂 The moths were an Orange Tip and a Speckled Wood, both butterflies. 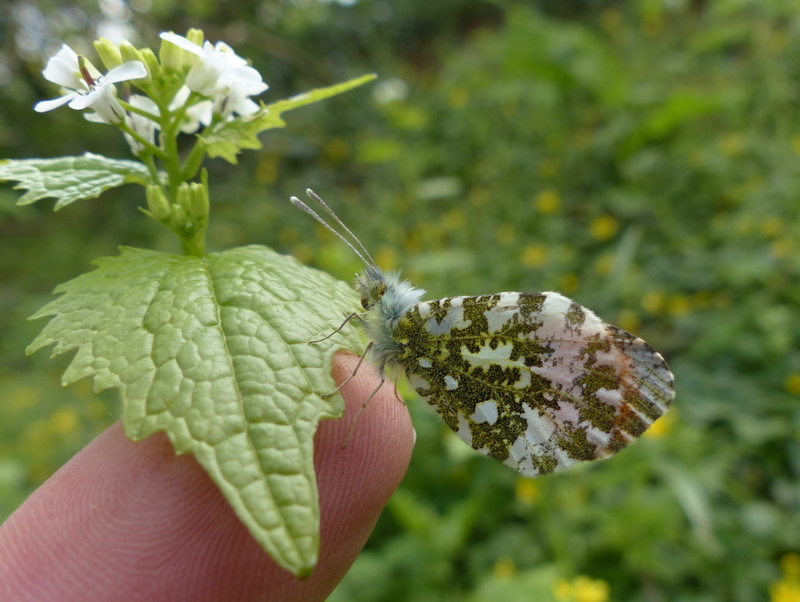 Last year I spent ages looking for a female Orange Tip and this year it looks like it is going to be the same story, I am not seeing any females. The search is on. Thank you Eliza 🙂 The Swallows are back and the pair that I filmed last year have reclaimed their old nest. It is really wonderful to see them again and their song, just before dawn, wakes me every morning. It is brilliant. 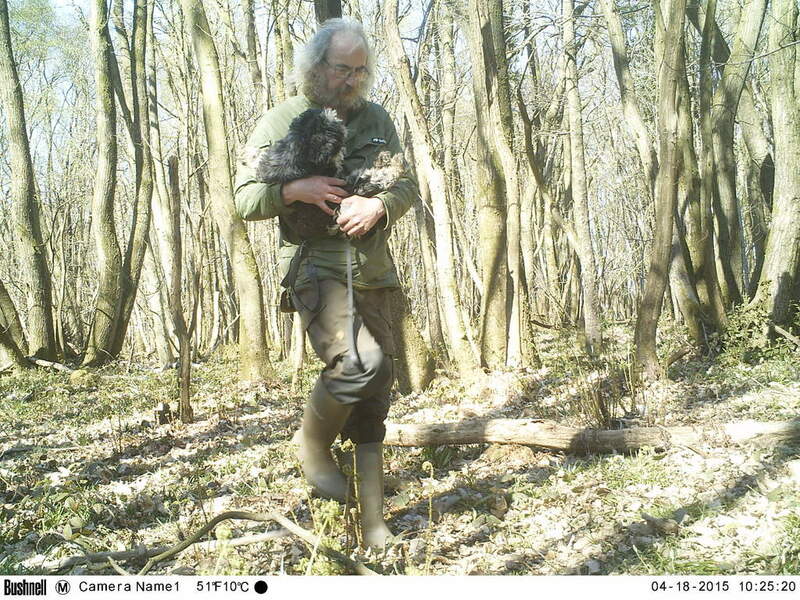 Good news – looking forward to seeing their new brood. Glad to read your adventures again – and beautiful to see spring has arrived in Europe! I just love that speckled butterfly. Do you know what it is? I’ve never seen anything like it, but with that wing detail, no doubt it really blends in with its habitat. Glad to see you’re back and all’s well on your side of the forest/world. Always nice to take a break from blogging and the internet – it can creep up on you and take away too much time from the natural world (if you let it). Thank you Vicki 🙂 I am trying to work fast because I have got so much to catch up on but I have got to tell you about the butterfly. It is a very old friend. 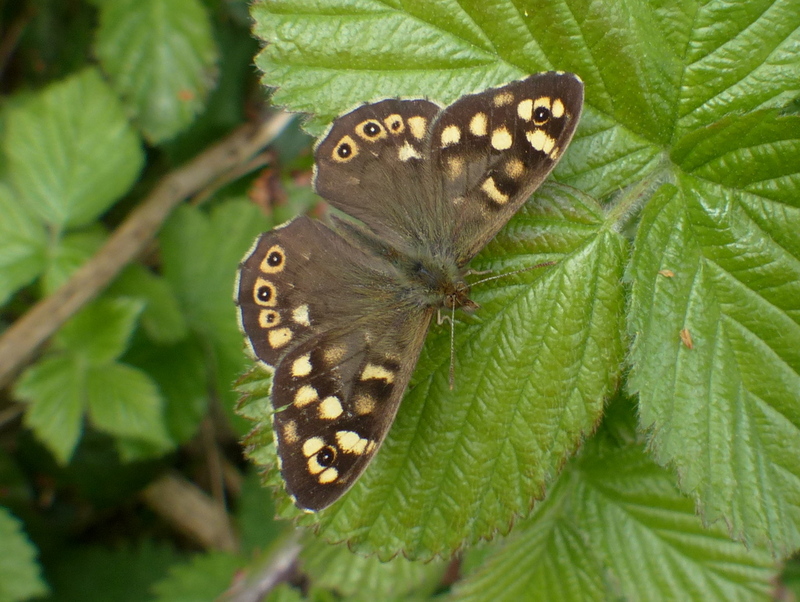 The Speckled Wood (Pararge aegeria) Unlike many butterflies this one doesn’t feed on the nectar in flowers, it feeds on Aphid honeydew that it finds on the leaves of trees. It lives in the forest with me, in the little patches of sunlight that it finds between the trees and it likes ancient woodland. Thanks for the info, Colin. Aphid Honeydew. Fascinating. Definitely an interesting wing pattern. So, so happy to see you back, Colin! (And adorable panting Fizz too of course.) You do have a way with the “faeries.” Beautiful photographs! I often think it is a shame that we buy greens from the shop when there are probably a great many “weeds” that are highly nutritious and probably quite tasty growing in the fields (and in my case, my own back yard.) I would like to know more about the edible plants here. That is another reason I enjoy your blog. I read your comment to Clare. My religious background as a child taught me to fear a god and feel constantly guilty. However, as life went on and various interesting things happened, I came to realise that those were more so rules made up by people. I have always felt a presence in my life. There were some times when quite remarkable things have happened. So I believe in a divine presence, just not all the rules made up by people about what it is. It is when I am out in nature that I feel closest to what is my God. There is much beauty, love and kindness in the world despite the evil we may see. What? 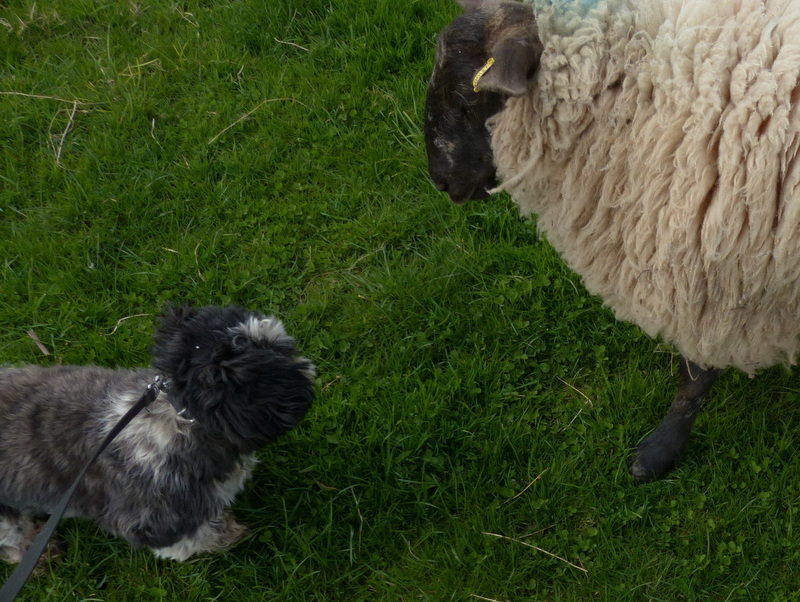 You are not afraid of those dangerous sheep in the wild outdoors? Looking at the photos makes me feel as if I too have been enjoying the woods. Happy news, Colin. You are meant to do this work, this play. Bear knows it. I am grateful. 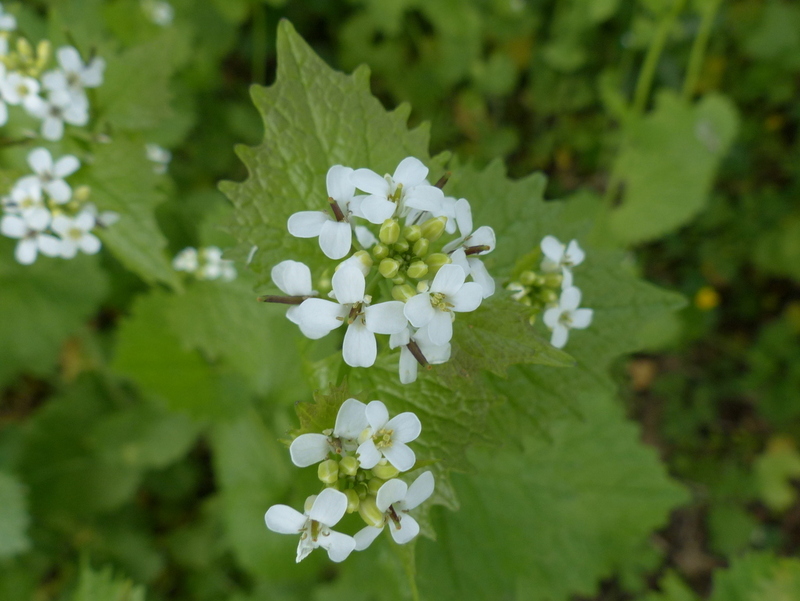 Now, about this garlic mustard. It is considered (by government bodies) a noxious weed in these parts, choking out great swaths of undergrowth in our woods. It’s a pity the deer don’t have a taste for it. one minor dilemma in our household: hubby is allergic to garlic and is too gun-shy to try the garlic mustard. But you make a very good point. Some lovely butterfly photographs. 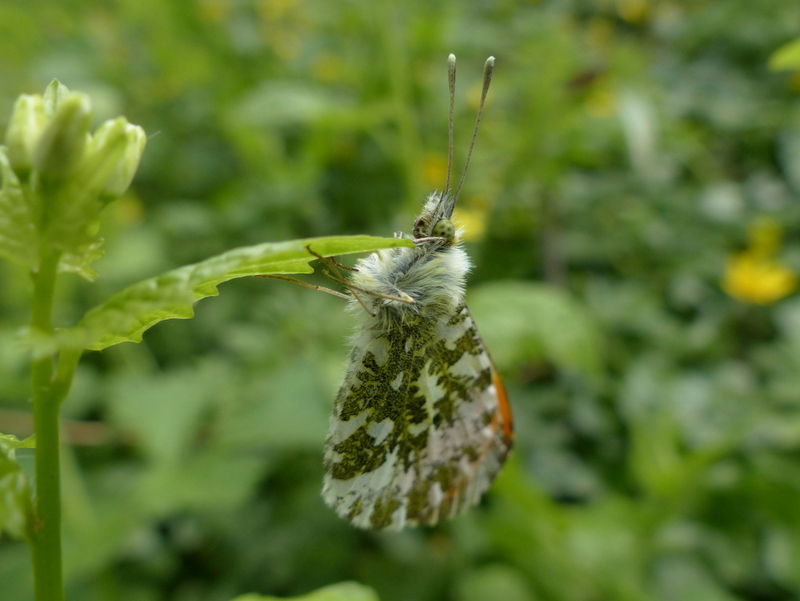 I had never seen the underwing of an Orange tip before as I’d only seen them flying. Up here in the East Midlands there is supposedly a shortage of Specled Woods. We have had one in the garden so far. Good to see you back! 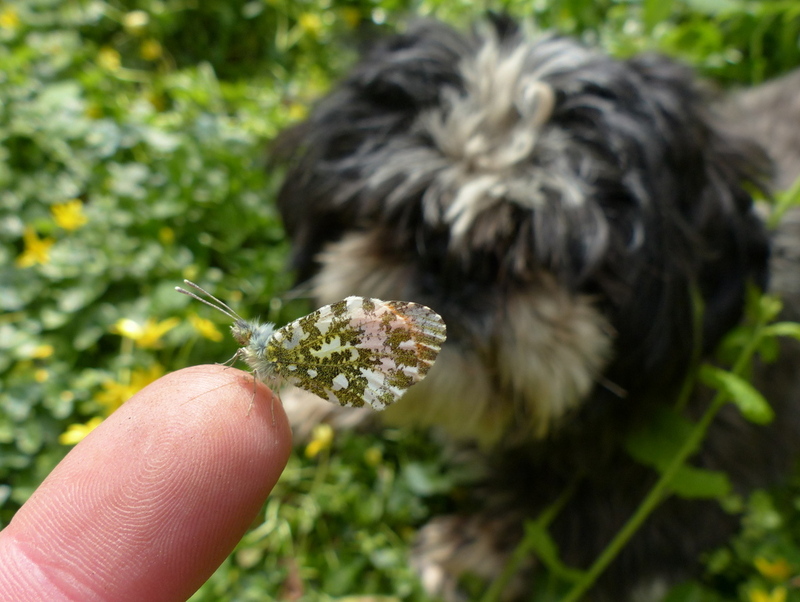 Thank you John 🙂 The Orange tip is a lovely butterfly but the females are so elusive. Every time I chase down a white butterfly it turns out to be a Green-veined white. 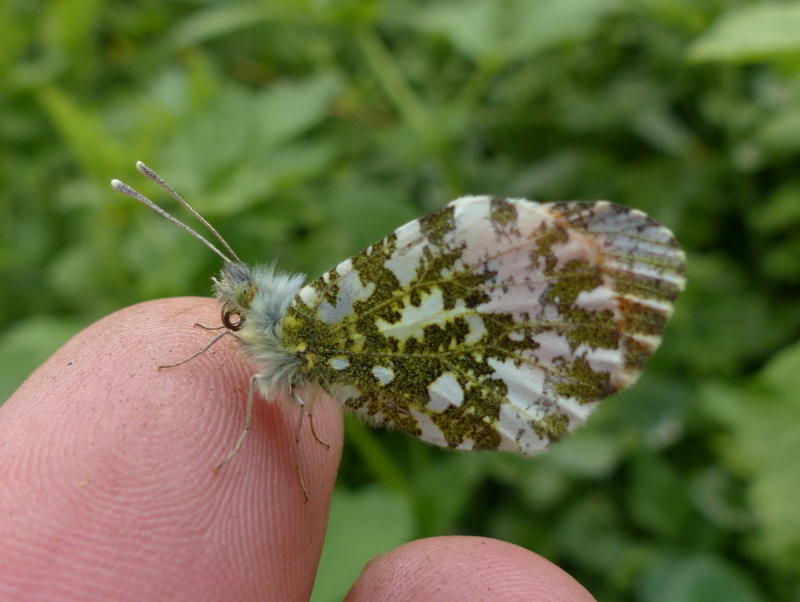 I was beginning to think that male Orange tips must mate with Green-veined whites. I found just one last year. 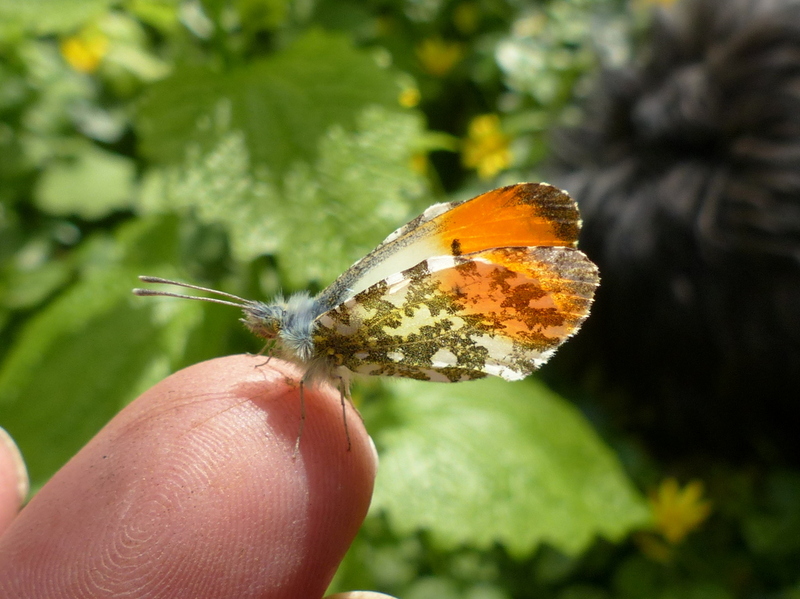 The female has the same intricate marking on the underwing but she lacks the orange tips to the wings. Oh, Colin. I am so glad you are back with us. I’ve missed you and your side-kick, Fizz, and your photos and information! I was happy to see butterflies, Blue bells, etc., and to learn that you have a year’s reprieve. 🙂 I pray you may stay on the farm, with Fizz, and share your wonders with us for as long as YOU want. My days have been rather dull, for a lack of description, and now I have great reading in my e-mail once more. Welcome back and enjoy each day. Your return has made many, many of us happy. 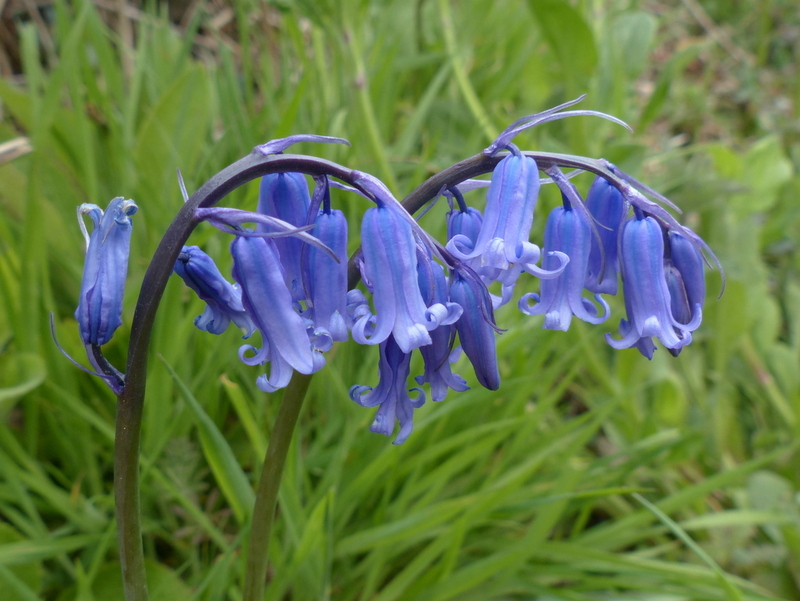 I saw a photo of the bluebells…lovely. Really glad to see you again Colin. I’ve read most of this posting (post and comments) and am glad for your stroke of good luck. Greetings from here and Happy Spring! Thank you for visting, I love Fizz. You are certainly a friend to the faeries. Of course, they are a fickle bunch and you can never tell whether they will approve of you in advance, but looking in from the outside I can see that they should have nothing to complain about from Colin & Fizz. Well, Fizz maybe. Gorgeous markings on the butterfly. What dreadful conditions you must endure to get those nature shots.